Every 100 years or so, our Sun gives off a great big belch that sends an intense wave of charged particles towards Earth. This wasn’t a problem in the past, but our high-tech civilization is now disturbingly vulnerable to these solar storms. A new study quantifies the economic risks posed by these extreme solar storms, while also proposing a super-futuristic solution to the problem: an Earth-sized shield built in outer space. The term “solar storm” is used to identify the various nasties the Sun can hurl our way, including x-rays, charged particles, and magnetized plasma. In 1859, a series of powerful coronal mass ejections (CMEs) hit our planet head on, disrupting telegraph stations and causing widespread communication outages.If we were to be hit by an equally powerful solar storm today, it would knock out satellites and electrical grids, disrupting global communications, transportation, and supply chains. Total worldwide losses could reach up to $10 trillion, with recovery taking many years. We have no idea when the next Carrington-like event will occur, but a 2012 paper proposed a 10 percent chance of one happening in the next decade. Indeed, like an earthquake-prone city built above a pair of conflicting fault lines, it’s only a matter of time before our planet is hit by the next Big One. And to make matters worse, we’re becoming increasingly vulnerable to these events owing to steady technological advances. 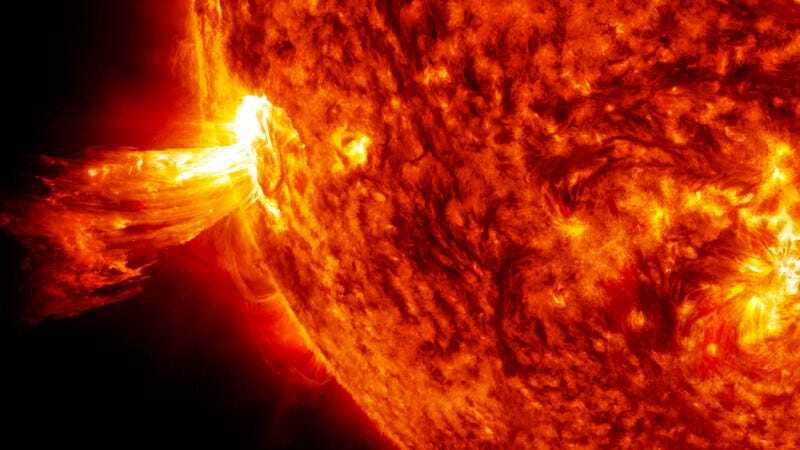 A new paper by Manasvi Lingam and Avi Loeb from Harvard-Smithsonian Center for Astrophysics is the first to consider the economic impacts of a sizeable solar storm in the future, when our reliance on technology is far greater than it is today. In addition, the authors propose a strategy to mitigate the effects—and they’re not thinking small. Lingam and Loeb say we should construct a massive shield in space, and that the costs would be far lower than having to deal with the aftermath of a solar storm. The researchers go on to argue that advanced extraterrestrial civilizations have likely done this already, and that we should search for these shields as a way to detect aliens. The new paper is currently being considered for publication in The Astrophysical Journal Letters. To help them with their economic model, Lingam and Loeb factored in two important assumptions. First, the longer the duration between powerful solar flares, the more powerful they will be. Second, our civilization will experience exponential growths in technology and Gross Domestic Product (GDP) in the coming decades. With these potentially catastrophic losses in mind, Lingam and Loeb turn to potential solutions. Unsurprisingly, the proposed mitigation strategies aren’t subtle, but of the three solutions considered, only one was deemed viable by the researchers. This Earth-sized “magnetic deflector” would be placed at the Lagrange L1 point between the Earth and the Sun at a distance of about 205,000 miles (329,000 km) from our planet’s surface. It would act as a current loop, and deflect the sun’s harmful particles back into space. The researchers say the required amount of deflective force is relatively small, and that we already have much of the technology required to make this possible. The big challenge, they say, will be to scale it up to its superstructural size. The authors say the price of the magnetic deflector is comparable to the total cost of the International Space Station, and that it’s about three to four orders of magnitude cheaper than the current global GDP—or the economic damage from a flare in about a hundred years time. But that’s if we use material from Earth. It may make more economic sense to build the superstructure using materials extracted from the asteroid belt. Sandberg’s concerns notwithstanding, a gigantic magnetic deflector makes a lot of sense, particularly for a technological civilization considerably more advanced than our own. And in fact, it’s conceivable that some hypothetical alien civilizations have done this already. It would be wise, argue Loeb and Lingam, for us to search for signs of these shields as a way to detect extraterrestrial civilizations. We could do it using the transit method, the exoplanet detection technique that aims to observe such objects when they eclipse their host stars from our vantage point here on Earth. Andrew Siemion, Director of Berkeley SETI Research Center and Principal Investigator at the Breakthrough Listen program, says our deep dependence on electronics has created a particular susceptibility to stellar flare events, and that Loeb and Lingam have the right idea. The authors of the new study are right to raise the prospect of solar storms as an important public issue. When it comes to mitigating existential or catastrophic natural hazards, our attention tends to be focused on asteroid impacts. Trouble is, solar storms happen with far greater frequency, so it would be a good idea to start thinking about mitigation strategies pretty much immediately. A solar deflector may be a sensible solution (eventually), but as Sandberg points out, it would also be smart to build a technological infrastructure that’s immune to the Sun’s harmful flares. The more angles we use to approach this problem, the better. Next Next post: Why Has Our Sun Been Freaking Out So Much Lately?